The Rushton Devon Five Sided Corner Summerhouse is a fantastic modern looking corner summer house that would fit in any style of garden. At 7 X 7 this is not going to take over a large garden and it is also going to be compact enough that it can fit into even smaller gardens. The large glass windows on the side are going to allow plenty of natural light as well as a good flow of fresh air on those warm summer days. The large double doors are made with some fantastic framework and six glass windows. The door is then made a great feature of the summerhouse thanks to the classic looking hinges and mortice lock. 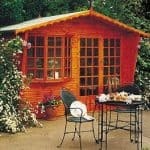 This summerhouse is made with very high quality materials. The walls are made with 15 mm tongue and groove shiplap cladding that is supported with a thick frame. This makes the summerhouse very strong and long lasting. The floor is made with 15 mm thick tongue and groove boarding which fits the style of the summerhouse very well, but it also goes with the look of the structure very well. For the roof they have used the same kind of tongue and groove boarding and covered it with some very smart looking roofing felt to protect what you have inside from the rain. 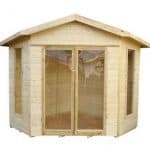 Today we are taking an eagle eye look at the Rushton Devon Five Sided Corner Summerhouse. This is a corner summer house that is not too big, but at the same time it is not to small either – think of it as the Goldilocks of summerhouses. It is a compact size, but with the right kind of planning, you can actually make the space go very far. You can see in the pictures there is a couple of chairs, a table and a whole lot of space left to play with. 6 feet 8 inches is the size of the width and the depth so it is not huge, but this is still a decent enough size. Especially for those who do not have a large garden. The summerhouse also stands at well over 6 feet high so the headroom is just as good as you would get with a 10 x 10 summerhouse. We love the design. 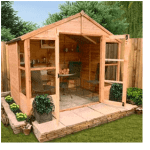 It is very modern and cool and we feel that no matter what kind of style your garden is, this summerhouse is going to fit right in. We really like the roof. It is a pent style roof and it has a very good slant towards the back of the summerhouse. We love the overhang and the decoration that they have in the middle and in general feel they have done a very good job in making the roof pleasing to the eyes. Now the roof is not just trying to skate by on its looks. They have used 15 mm thick tongue and groove cladding which is just as strong as it is good looking. If you take a close look at the picture, you can see that the frame on the roof also looks great. We are impressed that they have gone for 15 mm thick tongue and groove shiplap cladding for the walls. The norm for most other summerhouses we have seen is around the 12 mm range so that is a big plus for the Rushton Devon Five Sided Corner Summerhouse right there. It is thick and interlocked so well together that it is simply impossible for rain to get in through the walls. There is no point having a pretty corner summer house if the wind can damage it or if once you have had too many glasses of wine, you fall over into the wall, and you go right through it! Well that is not going to happen with this summerhouse. You see the framing in here is just great. They have a thick, solid and just generally robust 45 x 34 frame keeping it all together. 20 years after installation this frame is going to ensure that the summerhouse is just as strong as the day you built it. The floor is very strong and the reason for this is that they have used the same kind of 15 mm boarding that is used for the roof. This of course goes with the style of the rest of the summerhouse and that is something we really like. But as it is so strong it means you are going to be able to put any heavy items you like inside here and not have the floor buckle under the weight. The wood will be given a basic, water based treatment. But that is not enough to protect the wood from rot or decay. You are going to need to give the wood a coating of wood treatment. It is always best to do this sooner than later. Why keep putting it off until next weekend and risk the wood showing signs of rot? This corner summer house is actually quite low maintenance and it will just require one fresh coat a year to keep rot at bay. 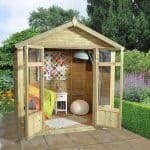 Here is where we tell you what kind of warranty you get with the Rushton Devon Five Sided Corner Summerhouse. Well it would be if they actually listed what the warranty was! At the very least you are going to get a 1 year manufacturer’s warranty which is what we think you will get as if it was a 5 or 10 year warranty they would surely make mention of it. The doors on this summerhouse look great. They are made with some very nice framework, plenty of glass windows and then finished off to perfection with some old timey looking hinges and door handle. The door when opened gives you a lot of room to get things in and out of the summerhouse. 3 feet 9 inches is the width and 6 feet 8 inches is the height. We are sure many of you will love sitting in the summerhouse on a hot day with the doors cracked open and a glass of wine in your hand. There are three smaller windows on each door, but there are two large windows on the sides of the summerhouse. We really like these windows and the fact that they have gone for mostly glass and not really used much of a frame really does make the windows seem huge. You are going to get a lot of natural light inside here and if it does get a bit sweaty just open up the windows to get fresh air inside. Strong glass has been used as well so during the winter months you are not going to lose a ton of heat through the windows. Keeping your belongings safe is a Mortice lock. We really like this as it saves you have to mess around adding pad bolts, padlocks or some kind of high tech laser guarding system that you got from MI5. In general this is a very secure corner summer house and your belongings will be safe in here. Well as long as you remember to lock the door of course. With the windows being so large, your belongings are going to be very exposed. You might want to consider adding some blinds that you can close when you are not using the summerhouse. So while we do love those big windows, we must admit that they do result in a lack of privacy. 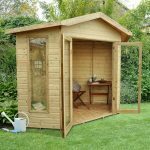 No official customisation options are offered with the Rushton Devon Five Sided Corner Summerhouse, but you can customise it yourself by using a bright, dark or even coloured wood treatment. There are a few different extras for this corner summer house that may interest you. They have a Pro Shed Base for £49.99. This is for those who are not too sure about the surface they will be installing the summerhouse on. To be honest this is actually a pretty decent price. If you want to kick up your security a notch, but cannot afford a 24/7 security guard, then they have a Security Hasp And Padlock Set for £4.99. The last extra they have is a Gardman Solar Light which for just £16.99 can give you some mother nature powered light in the summerhouse. A great job has been done with this corner summer house. They have made sure to use the best materials to make this a strong, but also very attractive summerhouse. Made with thick walls, floor and roof make this a summerhouse that is going to last a very long time. If you look after the wood properly then there is no reason as to why you cannot get a lifetime out of this. While not the smallest summerhouse we have seen, this is still on the compact size so it is going to fit in nicely in even smaller gardens. But if you want a summerhouse that you can party in then it may be just a little too small for that. For relaxation however, there is more than enough room in here for that. As long as the person you talk into helping knows the difference between a hammer and a screwdriver and is willing to take turns making the tea, then you will not have any problems putting this together. You are probably looking at 6-8 hours at the most for installation. The price we feel is very fair as we have seen a few slightly smaller and not as thick summerhouses being sold for a few hundred more. Made with strong and long lasting materials you are getting a lot of value for your money here. Final Thoughts: This really is a great corner summer house. The Rushton Devon Five Sided Corner Summerhouse has been made to not just be very pleasing to your eyes, it has been made so that you are going to get a lifetime of use out of it. 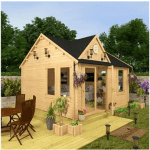 The thick cladding, floor and roof is just fantastic and a couple inches thicker than what most other summerhouses of a similar size and price offer. 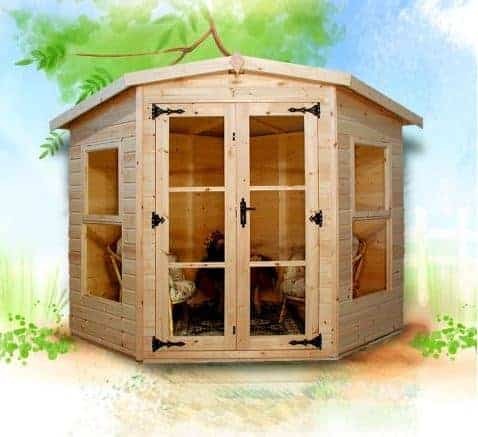 When it comes to summerhouses that are a little more compact in their size then honestly this right here is one of the best we have seen in quite some time and we are sure you will love it and have many good years with it.